Calling all horror punk fans – a true once-in-a-lifetime show is heading to The Forum!! That’s right, it’s the ORIGINAL LINEUP of the MISFITS, playing their one and only show of the year in Los Angeles on Saturday 30th December 2017!! Fans of the classic lineup, including Glenn Danzig, Jerry Only, Doyle Wolfgang Von Frankenstein CAN’T afford to miss this – book your tickets NOW, they’re in limited supply and aren’t going to last long!! Smashing expectations and breaking new ground from 1977 to 1983, The Misfits practically invented horror punk. After breaking up in 83, the band re-formed in 1995, several changes in lineup and sound. 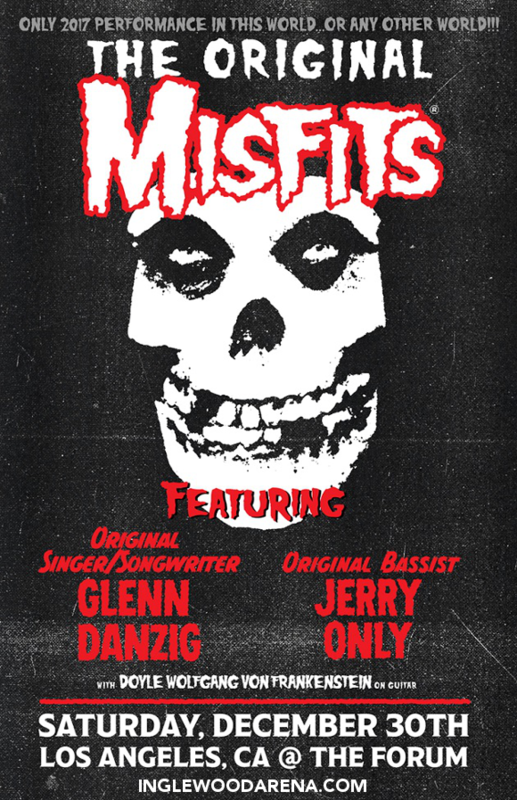 This special Misfits show, featuring the original band’s line-up has been teased by the band earlier this year, givings fans a tense anticipatory wait to see if the news was true!! The band have stated that they “may be open,” to doing more shows, but nothing has been confirmed apart from this one 2017 performance. This may be your last chance – you’d be mad to miss it! Book your tickets to see the Misfits NOW while they last! !